Man, we are totally in love with this BABE WAVE deal. 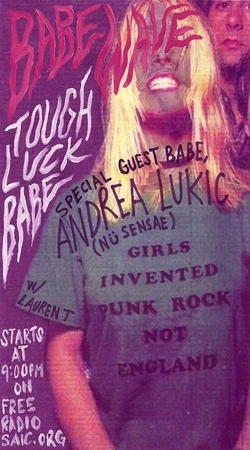 This week’s episode, Tough Luck Babe, is killer and strictly for the babes [meaning all the female rock and roll jams you can handle] Lauren also setup a nice Skype interview with Andrea Lukic of Nu Sensae fame. They chit and chat for a while about the roll females play in rock and roll and punk and what it’s like to be a part of that. Nothing we love more than sick girl bands. Shangri-Las to Kleenex to Kukl — girls got it going on. Andrea brings up an interesting point in mentioning an old Hole interview and talking about how girls today just don’t have that same unapologetic attitude that they used to. So, buck up girlies. It’s your world and we’re just lucky you let us in it. Check out the whole show below and send your praise on over to Lauren. And don’t forget!! 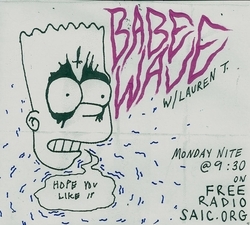 Babe Wave airs Monday nights from Free Radio SAIC at 9PM!